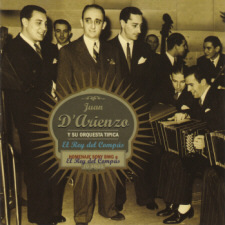 Celebrating 70 years since the signing of Juan D'Arienzo to RCA Victor in 1935, BMG Argentina have produced this slick new CD reissue entitled Homenaje a El Rey del Compás - Homage to the King of the Beat. This series is not his complete works (964 tracks by my reckoning - perhaps 45 CDs) but 310 of his best tracks spread over 15 CDs. 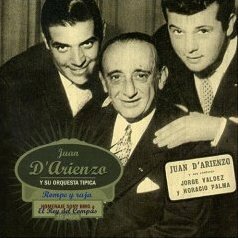 This beautiful new release, with good sound, excellent sleeve notes (Spanish only) immediately establishes itself as the series of choice for lovers of D'Arienzo's music, displacing the 9 CDs on BMG's Tango Argentino label. The graphic design is first rate - much better than what we have become accustomed to from Argentine CDs. Looking at the selections, it's very pleasing to see just how many of D'Arienzo's waltzes have been included: many more than normal. These have been under-representated in tango reissues of the past. After all, say the purists, waltz isn't real tango, is it? Along with the good points there are one or two oddities as well. BMG Argentina seem not to know, or not to care, that the main sales of these CDs will be in Europe and North America, and the excellent sleeve notes are only in Spanish. 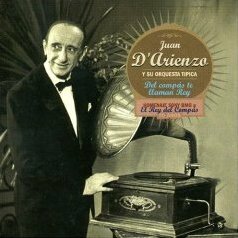 The series is also a little too even-handed, representing D'Arienzo's later years as much as his earlier ones, although in a patchy manner: the years 1960-1961, when D'Arienzo was at his most camp, get two CDs, whilst the period 1964-1975 (basically D'Arienzo's entire stereo output) is swept up into one CD. You'll still be buying those tracks somewhere else. Personally I would have preferred to have seen a little less of the 60s material and a little more from the 30s and the 70s - in fact the complete works from the 30s (117 tracks instead of the 53 we have here) would not have been out of place in a series of this quality. My suspicion is that BMG just don't have access to good condition 78s to prepare the transfers. They have added a little reverberation on many of the tracks of the earlier CDs. This is a common tick to disguise small imperfections. Many of the LP reissues of this material were the same, and so are the CDs reprinted from them. Here the use of reverberation is quite mild - you probably won't notice unless you have unprocessed originals to compare with. Still, I wish they hadn't done it. Complaints aside, this is an excellent release, and the new standard for D'Arienzo. 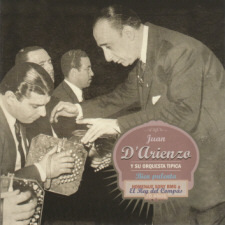 Brilliant album with 9 waltzes, including the hard to find Pabellón de las rosas, and two milongas amongst its twenty tracks. 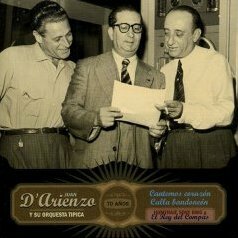 Superb sleeve notes inform you, for instance, that Lidio Fasoli is the pianist for the first five tracks, with Rodolfo Biagi joining for the recording date of 31st December 1935 that produced 9 de julio and Orillas del plata. Listen yourself for the change in style. Criticisms? 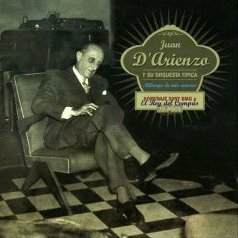 Early D'Arienzo is just so good, I would loved to have seen every track from this period, but that's hardly a criticism. The sleeve notes are only in Spanish. However, there are two tiny mistakes. 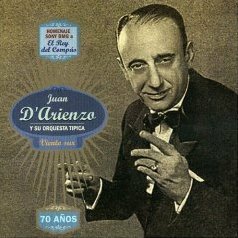 El flete has a jump at 1'54", just before the variación (use the version on Solo Tango instead), and the waltz Una lágrima has been transferred a semitone too quick - unless you've heard it transferred correctly you won't notice. As good as the first, with more rare waltzes. 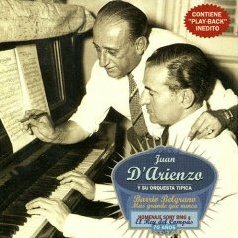 Biagi is the pianist on all these tracks except the last when, having left D'Arienzo to form his own band, he is replaced by Juan Polito. We also see the first appearance of Alberto Echagüe, but many of his great hits from the end of 1938 are skipped over for want of room. 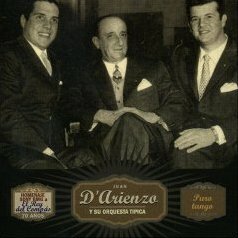 In March 1940, riding the crest of a wave of popularity, D'Arienzo lost his entire orchestra and his singer Alberto Echagüe when pianist Juan Polito left D'Arienzo to set up his own outfit. 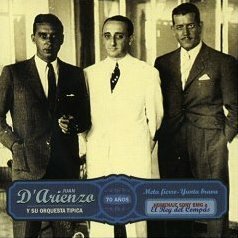 D'Arienzo persuaded bandoneónista Héctor Varela to put his orchestra at D'Arienzo's disposal, recruited Cayetano Puglisi as violinist, and placed an 18 year old Fulvio Salamanca in the pianist's chair. The new orchestra was even more successful than the old one. Five milongas, four waltzes. our price: out of stock - contact us. 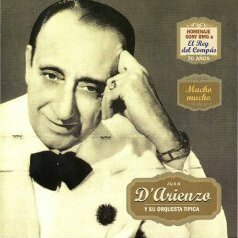 Echagüe's replacement as lead singer in the D'Arienzo orchestra was Héctor Mauré. Before and after Mauré, every singer in the D'Arienzo outfit had to fit themselves to the compás of the orchestra. With Mauré however things were different. He imposed a more equal relationship between orchestra and singer, very much the mould of the 1940s. 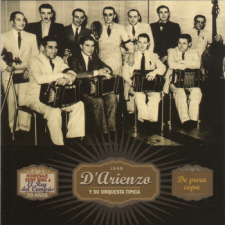 The fifty numbers they recorded together may not be the most representative of D'Arienzo's output, but they do rank amongst the highest in quality. Towards the end of 1944 Echagüe returned and Mauré left not long after. 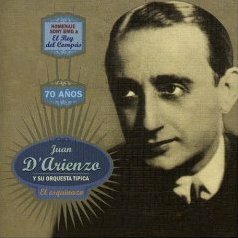 The drop in quality of the orchestra is dramatic; D'Arienzo/Echagüe, one of the great binomials of tango, simply doesn't do slow tango very well, and musically the second half of the 1940s represents a lull for the orchestra. 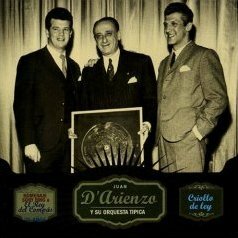 In 1950 the D'Arienzo orchestra magically reinvigorated and reinvented itself as the orchestra with a driving compás par excellence. 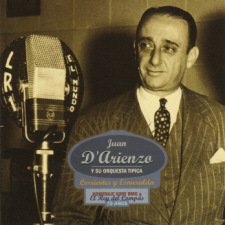 After five months without recording anything - unheard of for the orchestra - they returned to the studio in May 1950 and recorded Canaro en París. Singers Echagüe and Laborde prove that the best vocal numbers from this period are almost (note that's "almost") as good as the stunning and entirely famous instrumentals. The band, unchanged since the second half of 1950, are rock solid. 1960 and D'Arienzo is at his most camp. Jorge Valdez and Horacio Palma share the majority of the vocals.